On the penultimate day of Star Wars Celebration in Chicago, fans of the franchise were treated to more insight about the upcoming "Mandalorian" live-action show coming to Disney's streaming service, Disney+. Executive producers Jon Favreau ("Iron Man") and Dave Filoni ("Star Wars Clone Wars") lead a panel Sunday along side actors Pedro Pascal ("Game of Thrones"), Gina Carano ("Deadpool") and Carl Weathers ("Rocky"). The series, set just after the events of "Return of the Jedi," revolves around a mysterious gunfighter making a name for himself during the transition from Imperial rule to a New Republic. Favreau said that much of the inspiration of the series came from spaghetti Westerns and samurai films, particularly from Sergio Leone and Akira Kurosawa films. "The Mandalorian is a mysterious lone gunfighter in the outer reaches of the galaxy," Pascal said of his character during the panel. "Some might say he had question moral character." Nick Nolte ("Cape Fear"), Giancarlo Esposito ("Breaking Bad"), Emily Swallow ("The Mentalist"), Omid Abtahi ("American Gods") and Werner Herzog ("Nosferatu the Vampyre") round out the rest of the announced cast of the series. Filoni and Favreau said that they needed more stormtroopers for a scene in the show and didn't have enough costumes on set. So, they reached out to the 501st to act as extras. In particular, Lucasfilm created a model of the Mandalorian's ship the Razor Crest, reminiscent of the ones used in the original trilogies, and placed it on rigs to make it appear like it was flying through space. 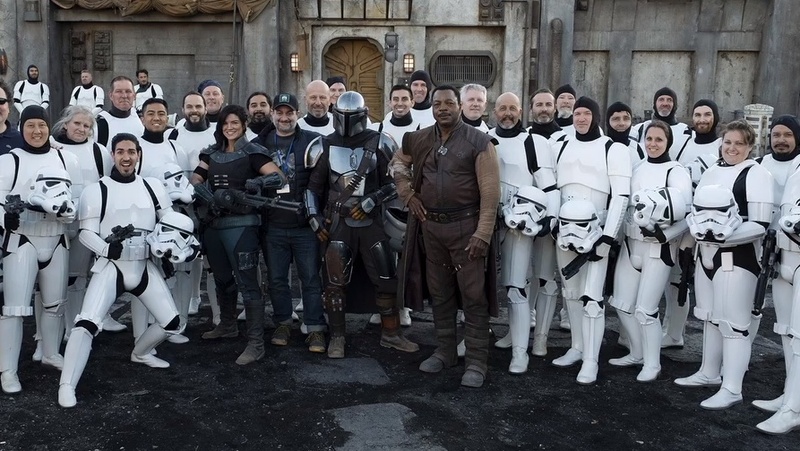 "The Mandalorian" series will be available to fans at the launch of Disney+ on Nov. 12, Kathleen Kennedy, head of Lucasfilm said. Also in the works for Disney+ from the Star Wars Universe is a new season of "Star Wars Clone Wars" and a live-action show based on Cassian Andor and K2-SO from "Rogue One: A Star Wars Story."